In the seventies, science fiction and horror filmmakers were certain that mankind was going to soon face his comeuppance for polluting and over-populating Mother Earth. And more so, that this comeuppance was going to be delivered at the paws, claws, talons, webbed fingers, and teeth of our former friends: the animals. Call it the Circle of Death. Between 1970 and 1979, more than a dozen genre films involved Mother Nature striking back against man for his mis-use of pesticides, his damage of the ozone layer, and for polluting previously unspoiled terrain. Among these movies were titles such as The Bug (1975), Food of the Gods (1976), Kingdom of the Spiders (1977), and Empire of the Ants (1977). From a certain perspective, even blockbuster films such as Jaws (1975) — which saw a great white shark attack a beach town’s economy virtually forty years to the day that atom bombs were dropped on Japan — and Dino De Laurentiis’s King Kong (1976) — in which the noble ape was exploited by an Exxon-like oil company — tread into this then-popular “revenge-of-nature” territory. So with that prologue in mind, here is a look back at five of the most bizarre Revenge of Nature films of the 1970s. Advertised with the terrific tag-line, “Today – the pond. Tomorrow – the world,” this film reveals that the South shall fall again…only this time to invading armies of frogs. 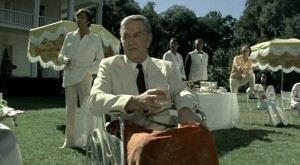 Specifically, the film involves a 1%’er Jason Crockett (Ray Milland) who intends to host his birthday party at his expensive Southern mansion, only to learn that nature has other perhaps. Perhaps the frogs don’t like his statement that he is among “the filthy rich,” but more likely, they dislike the fact that humans have polluted the river around his estate. When the frogs finally attack Crockett’s, they cut the phone lines (!) at the mansion, and act strategically to wipe out the humans. The frogs are also assisted by other attacking animals, including a turtle, water snakes, a crocodile (with its mouth visible taped shut…) and even leeches. 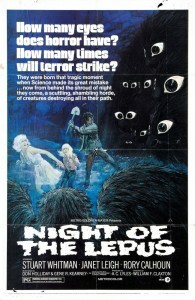 In this unforgettable horror film from director William F. Claxon, a town in Arizona is under siege from a burgeoning rabbit population, and two good-intentioned scientists, Roy (Stuart Whitman) and Gerry Bennett (Janet Leigh) seize on a brilliant idea: they manipulate the rabbits with special hormones. Alas, the plan goes strangely awry as the affected bunnies grow to gargantuan size and go on the war-path against mankind. In the film, these giant rabbits are actually regular-sized rabbits…only seen hip-hopping across miniature sets in slow-motion. Star Janet Leigh summed up Night of the Lepus’s essential problem when she noted that “no matter what you do, a bunny rabbit is a bunny rabbit.” In this case, Mother Nature struck back in the cutest, most non-threatening way possible. From the great William Girdler (Grizzly , The Manitou ) arrives this horror tale showcasing how animals — and human beings too — might behave when ultra-violet rays from the Sun reach Earth and the damaged ozone layer fails to protect the planet’s inhabitants. Specifically, Paul Jenson — a character played by Leslie Nielsen — goes crazy, rapes a fellow hiker in the woods, and then proceeds to go one-on-one (and bare-chested) against a giant grizzly bear. Unfortunately, Paul doesn’t survive the wrestling match. Meanwhile, other characters in the drama battle a pack of wild dogs, and invading rats. So basically, ultra-violet rays turn all creatures great and small into violence-prone maniacs. 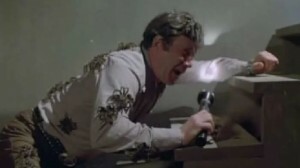 The best and most terrifying film on this list, Kingdom of the Spiders pits William Shatner (as a veterinarian named “Rack”) against thousands of tarantulas…again in Arizona. In this case, the arachnids team up to defeat mankind after the over-spraying of pesticides kills off their food supplies. The spiders march on peaceful Verde Valley, and — even though tarantulas can’t spin webs — cocoon all the townsfolk up…to eat at a later date. If you have the slightest fear of spiders — or even if you don’t, actually — Kingdom of the Spiders is legitimately terrifying. The last act involves a siege situation on an isolated forest lodge, and sees Shatner veritably buried in real life spiders, and self-same spiders being stomped upon by the cast members…by the dozen. The film’s final, valedictory shot is also a classic, depicting the dawn of the spiders and the downfall of man. In the beautiful forests of Maine, campers are being murdered by a strange monster. When an environmentalist (Robert Foxworth) and his wife, Maggie (Talia Shire) investigate, they learn that Mercury pollution from a nearby paper-mill has been mutating the local wild-life, including the tasty fish that (pregnant) Maggie has been sampling. Before long, the heroes of John Frankenheimer’s Prophecy must battle a giant mutant bear, mutant squirrels, mutant tadpoles, and other beasts born from the hell of pollution. Although the film’s photography is gorgeous, Prophecy — like many of the Revenge of Nature films on this list — lapses into unintended comedy during some of its monster fights. One of the most beloved and ludicrous such scenes involves the mutant bear attacking a family of campers at night.